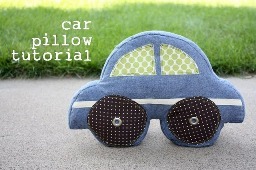 Anna from Noodlehead guest blogs over at Craftiness Is Not Optional with a free pattern and tutorial showing how to make this super cute car-shaped pillow. VROOOM!! Go to the free pattern and tutorial.